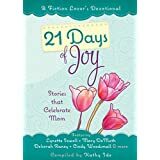 Sunday is Mother’s Day and I couldn’t think of a better way to honor the Mother’s of this world than by sharing a book review I did for Kathy Ide entitled “21 Days of Joy”. Kathy was one of those many wonderful people I met at the Mt Hermon Writer’s Conference, who were ready to assist and help us become better writers. They shared their talent and expertise with those of us who were still novices and struggling with the ins and outs of writing, publishing and marketing. So when she extended the invitation to write a review for her latest book in her “21 Days” series in exchange for a free book, I was eager to do it. And I was not disappointed. Kathy has taken the genre of fiction to depict wonderful narratives about mothers that are as real as if were experiencing it. “21 Days of Joy“ is a compilation of stories written by different authors about our journey through life around the theme “Celebrating Moms”. At the end of each story are defining ways of application to our lives. Each story is a snapshot of life’s challenges for Moms and ways we can reflect and apply God’s word to similar situations in our own lives. The stories were so real and masterfully crafted, I thought at first I was actually reading true stories of people. The ideas were taken from real life situations that you or someone you know may have or is experiencing. Because they reflect the working out of God’s love, redemption, strength they are applicable to our own lives. How do you handle betrayal, jealousy, or being a step-mom desperately trying to be a mom to her husband’s children? When you have raised an adopted child as your own who now wants to reconnect with her biological mother, what do you do with the feelings that say, will she now love that mother more than me? How do you connect with a Mom who had simply walked out of your life when you were a kid, who has returned, asks for forgiveness and wants a second change? 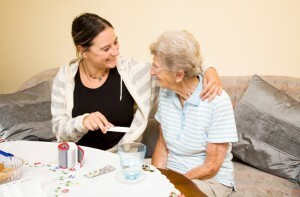 How do you deal with the complexities of an elderly Mom in the stages of dementia leaving you as child to now being parent? As Kathy shares her own story of the challenges of teen years, becoming a parent herself and now connecting with her Mother as friend it becomes a fitting ending to this wonderful book. It is a book about relationships, and as most of us know relationships with those we love can be strained, difficult and challenging, but when we include God in the journey, they become a blessing in our lives. a great gift to give yourself and to your Mom. Happy Mothers Day to all mothers everywhere who struggle to be patient and loving as they teach and model what it means to be a caring and responsible adult.